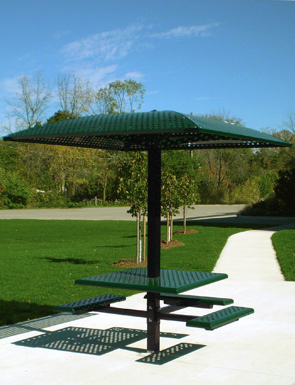 Enjoy the outdoors with this two-in-one square picnic table with attached sun shelter. Provides a permanent shade structure that shields from the sun's UV rays and protects from damaging weather. Single pedestal design will be appreciated by landscape crews for its easy maintenance. Ideal for playgrounds, parks, forest preserves. Perfect for outdoor dining areas at restaurants and café. Available in a wheelchair accessible model. The state of the art finishing process used on the table combines the application of an 'Electrocoat Zinc Rich Primer' with a durable polyester powder-coat top layer to ensure every crevice and joint is completely sealed, providing full protection against	corrosion and weathering. Tables are finished in either a gloss or textured polyester powder-coat finish. 85" x 85" Square Canopy Dimension. 4" x 4" Square Pedestal. Universal access outdoor table conforms to latest ADA specifications.